Aston Villa Football Accessories In Stock Here! This is the Aston Villa Football Merchandise And Accessories shop at Soccer Box. If you are looking for an Aston Villa themed gift or novelty souvenirs this is the place to be. Using football merchandise and accessories is a great way of showing you team support every day. Aston Villa football merchandise is a fantastic gift idea for any proud fan. The Aston Villa football merchandise and accessories sold at Soccer Box are all official and fully licensed by the club. You can choose from an extensive range of accessories, whether you are looking for yourself or as a gift you are sure to find something suitable at Soccer Box. We have products suitable for kids and adults at a range of prices to suit any budget. 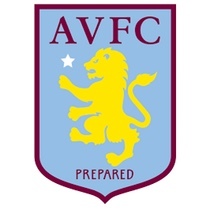 Aston Villa football accessories and merchandise available to order today! If you are an avid supporter of Aston Villa football club you can surround yourself with team merchandise at home, work, school or in the car to show pride in the team every day. We stock a range of Macron accessories that perfectly compliment the Aston Villa football shirts and jerseys that are also manufactured by Macron. Many fans will have the official match day jerseys, if you are buying a gift consider merchandise that will compliment the shirt and be used every day. Wearing the team’s football jersey to the match most fans preferred choice, you can team your shirt with a great range of accessories that will add to your team spirit of match day. In colder weather a knitted hat and scarf are the perfect accessories while in the stands at Villa Park cheering on the team. In the summer merchandise such as an Aston Villa baseball cap may be a better choice. You don’t need to attend the matches at Villa Park to use the Aston Villa football merchandise. We stock a great range of accessories that are great for using around the house every day. Merchandise such as an Aston Villa mug is a great gift choice that can be used every day. You could use your football mug at work to proudly identify yourself as a proud Villain. If you not only watch football but also enjoy a game we have a range of accessories that are perfect for you. Why not use an Aston Villa football instead of a plain soccer ball for your kick-around. Accessories such as the Aston Villa drinks bottle are an essential for staying hydrating. If your youth is fan of Aston Villa football club there is a wide selection of accessories and merchandise that they are sure to love. You could shop for Aston Villa home merchandise such as a quilt cover, clock and other accessories enabling your youth to have a football themed bedroom. If you have specific accessories in mind browse the Soccer Box shop, we have an extensive range of merchandise including Aston Villa football shirts meaning you are sure to find something suitable. Don’t forget we also stock the official football shirts and training kits to use alongside your football accessories. Aston Villa football accessories and merchandise available for fast worldwide shipping! Order at Soccer Box today!